I took lots of photos and typed in detail for the final day, so I hope you enjoy this final entry! I had a good night of sleep for my final night and awoke to an odd crinkling noise. I was a bit disoriented and then realized the sound was RAIN! Not acceptable for a final day! It was just a slight mist as if I was in a cloud and it was pretty cold out in the upper 40s, so I lounged in the tent hoping it would stop…and it did, whew. I packed up and wore my rain pants, long sleeves, and rain jacket. The rain had stopped, but I knew I had lots of cold wet brush to go through and I was right. I warmed up, but the temps stayed cool for the day and it cleared a bit as I headed up the last major climb of Jay Peak. There is a lodge there that usually sells food, but it was closed. 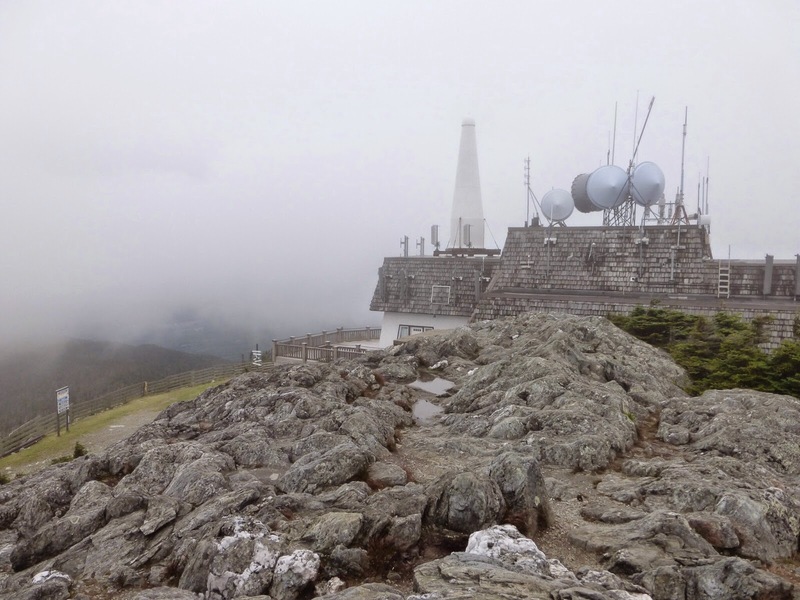 The clouds were still coming in and out, so the view was a bit obstructed. 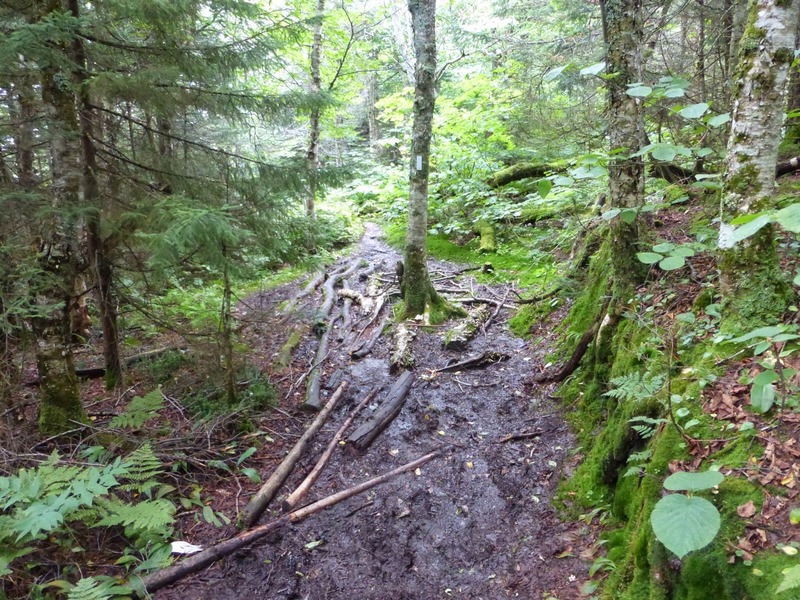 The hiking today was much smoother with more trail that I could relax on and less of the jarring slick up and downhill on mossy rocks and roots. It was a good way to end the hike. There was still brush and mud to contend with, but it wasn’t bad. I’ve been holding back on commenting about this because I didn’t want to jinx anything, but I am shocked at how well my body has responded to the hiking this summer. 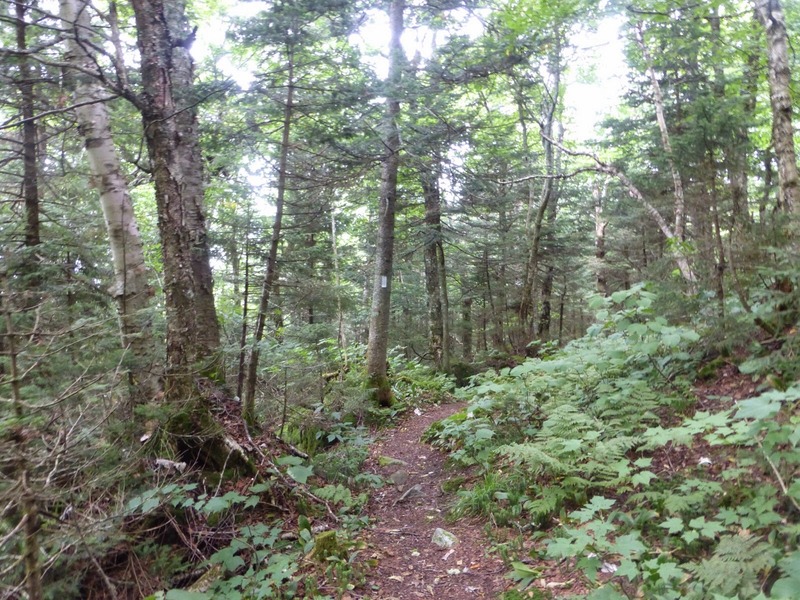 I actually feel like I could physically keep hiking…mentally, I am ready to take a break for awhile. I am most shocked by my weak ankles (known in previous journals as bad and fat ankles) and that they survived. They rolled from time to time each day, but nothing major and I feel really fortunate to have survived without a major issue. I was extra careful today as I was paranoid that I’d do something stupid on the last day. I was just careful in my footing not wanting to fall on the last day. 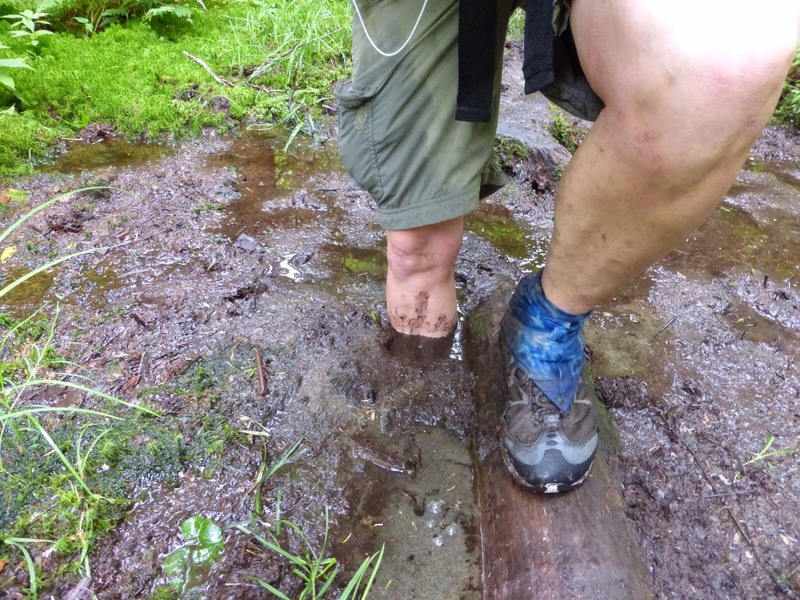 I kid you not, just ten minutes from the border, I came to a slick log in a muddy spot, told myself to take my time and my first step slipped right off the log sucking my leg almost to my knee…I had to laugh at myself and take a photo. 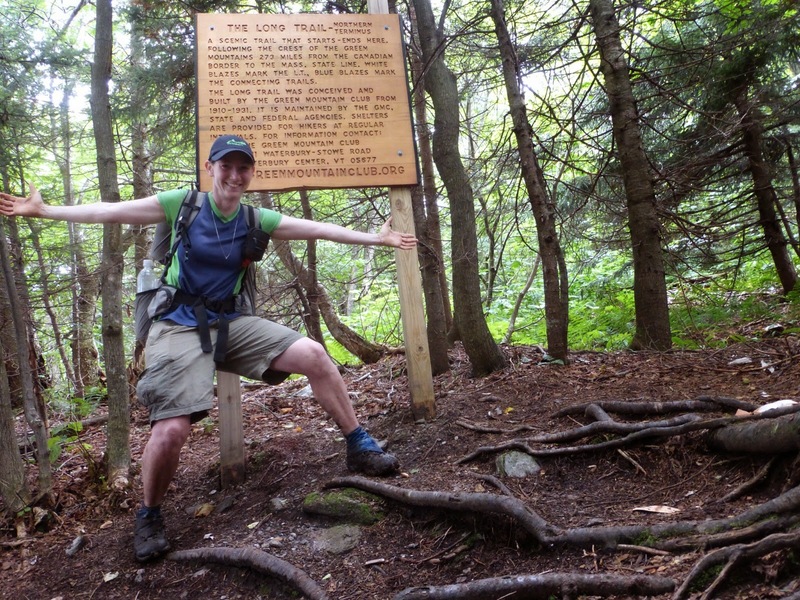 One last farewell kiss from the Long Trail! I loved the sky today! The clouds, dark blue hues, and distant mountain ranges reminded me of the Cascades and the end of the PCT. It was pretty perfect in my book. 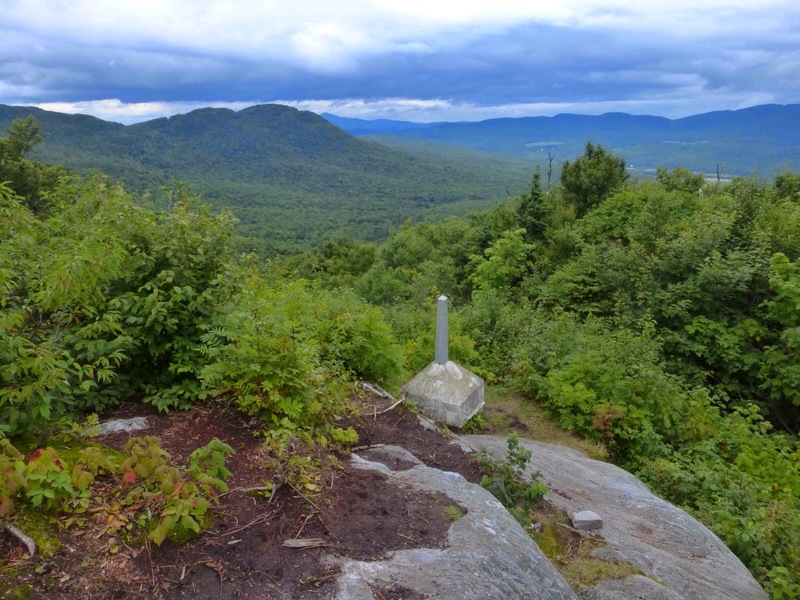 At the end of the Long Trail, there is a rocky outcropping and when you climb up on it, this is the view you are hit with. I was stoked! 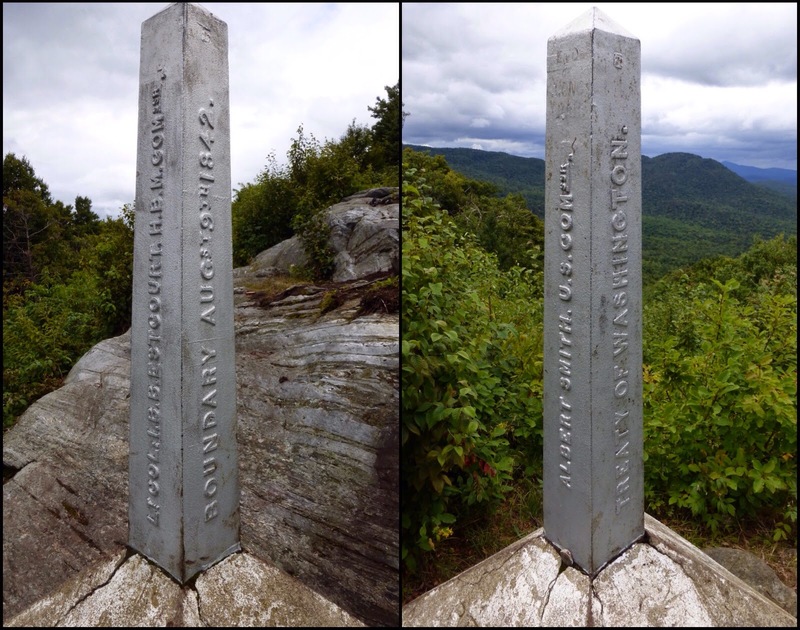 There is a swath cut through the trees like the other border endings, but it is less defined and you can see it slightly in the distance behind the monument. 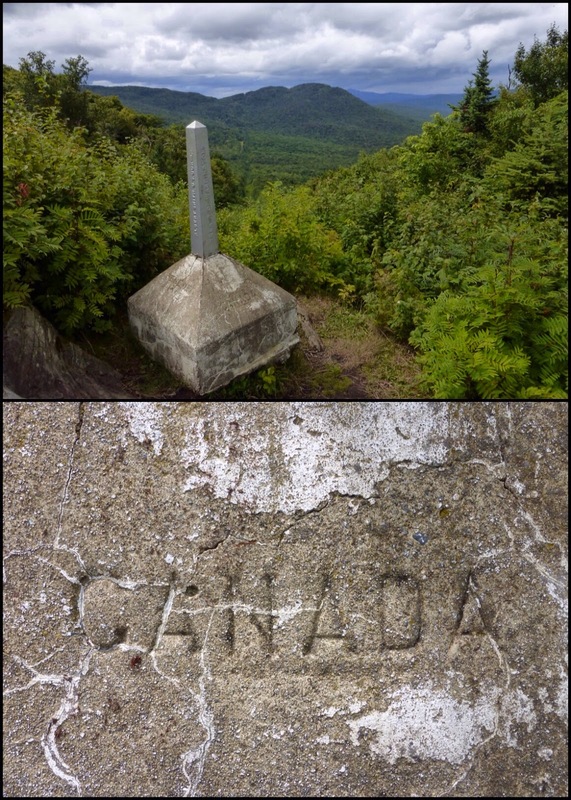 I saw CANADA carved into the monument and got a great rush. I made the right choice to end the summer here! I had time and took an hour to sit on the rock and have lunch hoping a hiker might pass by to help with photos. I was happy to be having the last of my trail food for awhile and look forward to regular meals. Speaking of which, I want to thank my step mom, Robin, who did another amazing job of sending out my resupplies and being a home base for all of you that sent care packages. Robin is now a triple crown resupplier! THANK YOU ROBIN!!! So, no such luck with another hiker coming along, but I was fortunately able to get the camera propped up again for good shots. I can say that this past week and especially being solo today seemed quite fitting to end this summer. 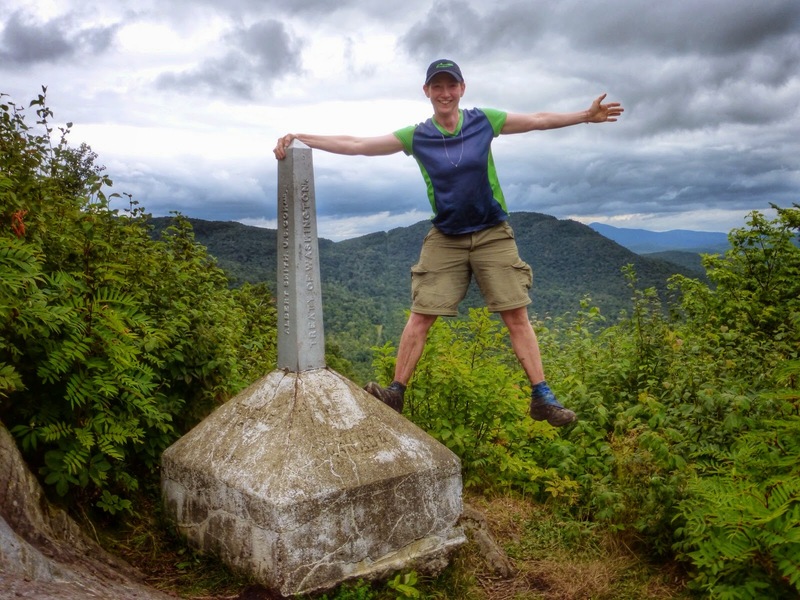 I always think these trails have something to teach me if I’m open to receiving the message and I think the LT was hitting me over the head with solitude to realize how fortunate I was to have bonded with others on the AT. 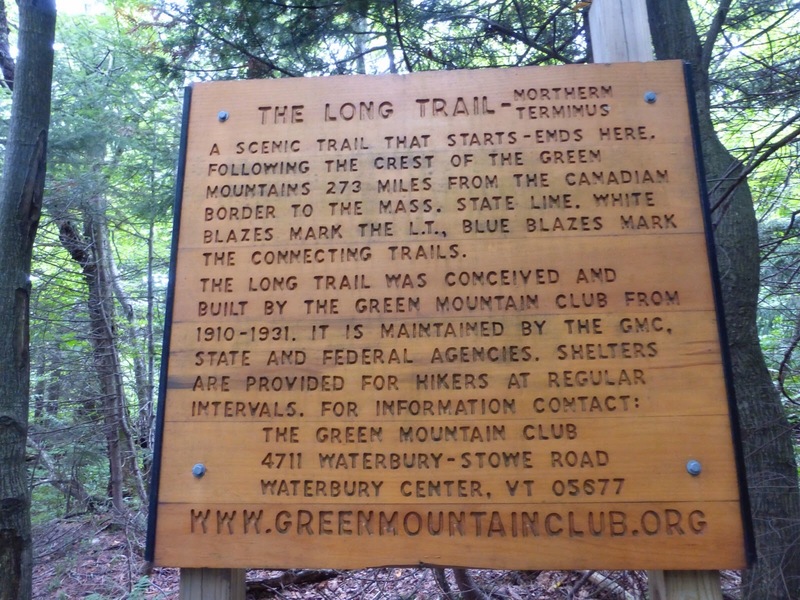 It really drove home much of what I learned on the AT about sharing the experience with others and I’m going to do my best to be more open to that in the future…ok Long Trail!? Did you hear that!? I’m calling mercy! Those of you that have followed all summer will remember Ferris who I overlapped with for a week my first month on trail. 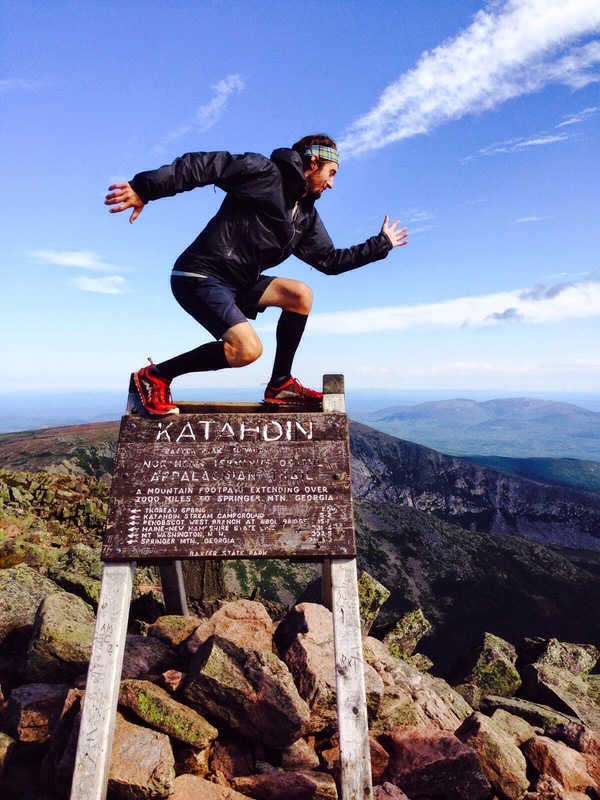 He coincidentally finished on Katahdin today so here’s his finishing photo which is just great! Way to go Ferris!!! 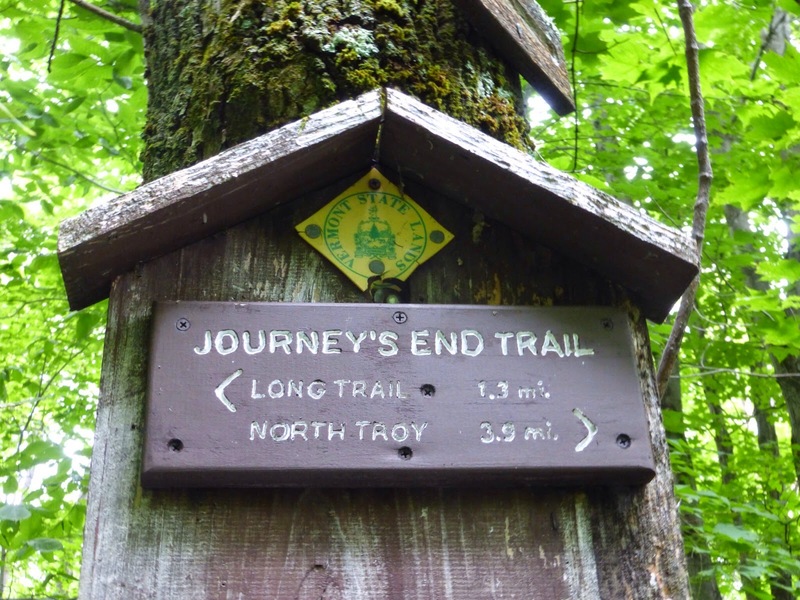 In order to get to civilization, there is a 1.3mi trail called “Journey’s End Trail.” How perfect is that!? I had no idea that it was named that until today and I got goosebumps of pride when I saw it written on the sign at the end. Pretty darn great way to end this summer! 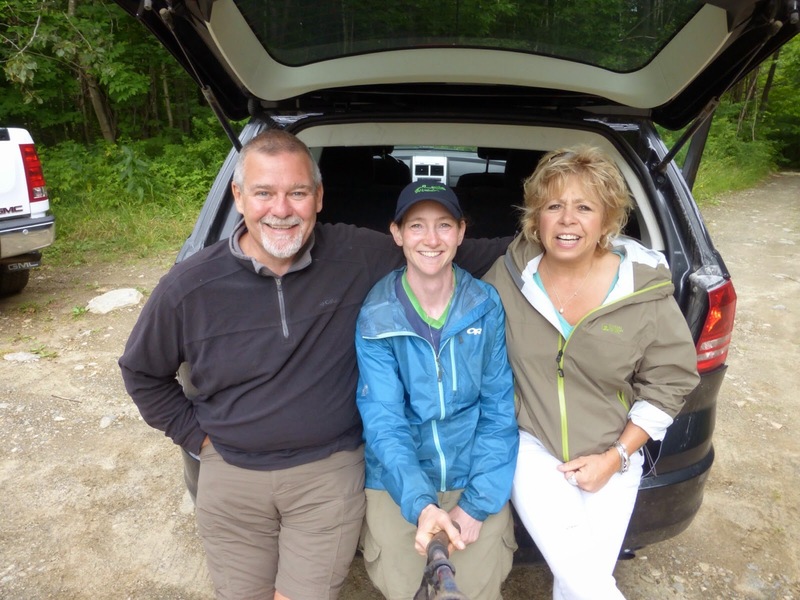 I mentioned the other day that I had met hikers Terry and Sherry earlier this summer in July when the AT overlapped with the LT. They offered to shuttle me at the end and host me on my final night. The timing was perfect and they even arrived with pink lemonade and chocolate milk! 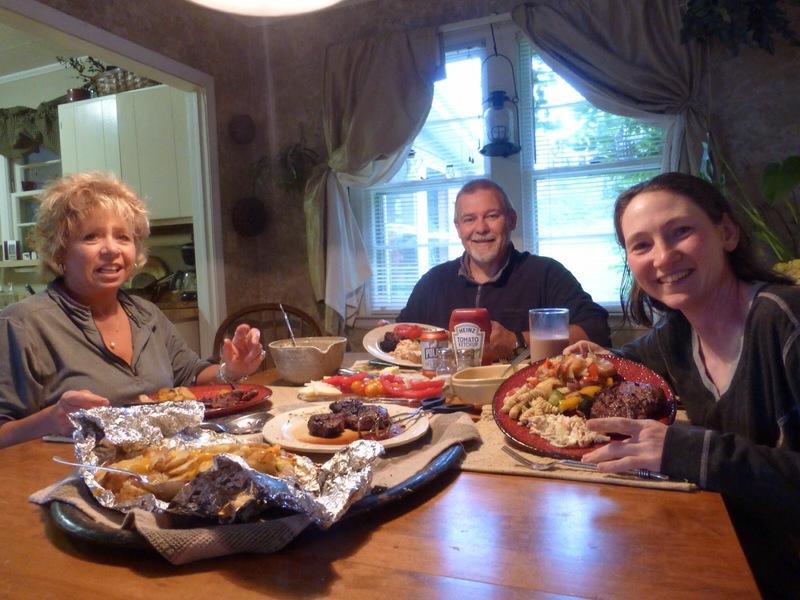 Terry and Sherry were awesome hosts and I got to end the hike with a celebratory homemade steak dinner! 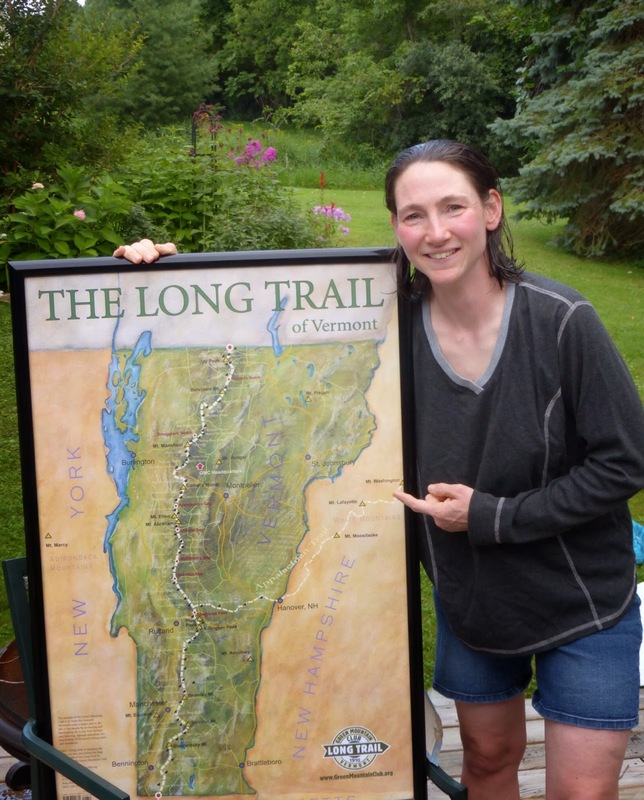 It was fun to talk trail as they have done the Long Trail and know it quite well. They even had a great framed poster of the trail and it was cool to see all I had done. THANK YOU Terry and Sherry for sharing this great day with me and making it even more memorable! I get the question, “What’s next?” all the time and my first answer to this is REST and HERMIT TIME! I am not done hiking and there are many options on the list. It was mentioned after the AT that Jett Cat and I are contemplating the Te Araroa trail in New Zealand this winter. It will be some time before we can figure out if finances and timing will align for that, but if it doesn’t happen this year, I know I have things I would like to hike this coming spring and summer. Don’t worry, I’m not done yet. 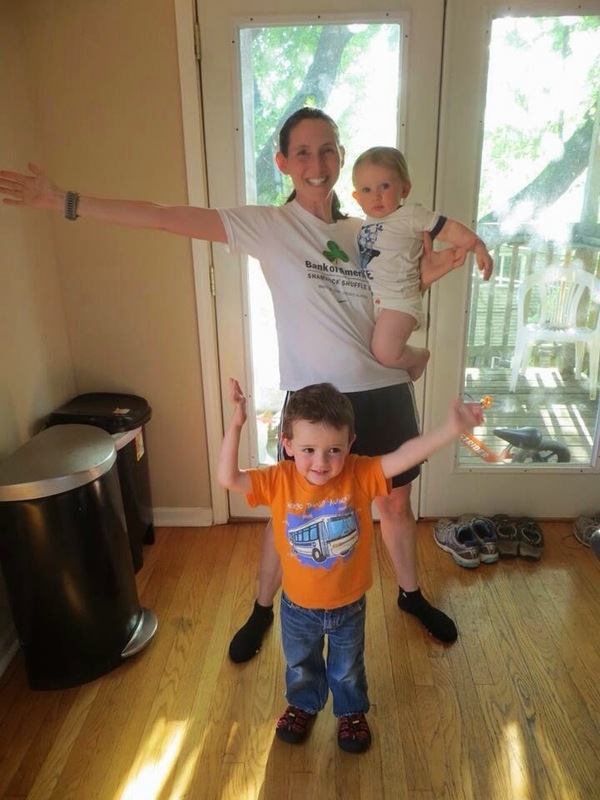 As for the immediate future, I’m going to Boston tomorrow and then I will fly to Chicago where my twin sister, Siobhan, is with my two nephews(1yr and almost 3yrs old). My sister has done a ton to make it easier for me while I’m trail and actually does a lot to help with the blog each night by doing final photo edits I can’t do from my phone and then posting them to Facebook for everyone. I definitely owe her big time so I will be helping to take care of my nephews for two weeks so she can get a break. I think this may wear me out more than the hiking, ha! Here they are attempting Wired poses with my sister, so we will work on perfecting that! Plus, just yesterday, little Aidan started walking! I’m the proud aunt so I’m attaching the video as I’m sure he’ll grow up to be an awesome hiker someday. For now, I’m just excited he’ll be ready to walk with aunt Wired! I’ll return to Portland, OR in September get right back to the life I love there. Substitute teaching and nannying to save up for the next big venture. So hopefully, I’ll be back sooner than later. If you haven’t subscribed to get my updates by email, the link is in the upper left hand corner of the blog. I also throw things on my Wired Facebook page from time to time that doesn’t make the blog. Again, thanks for sharing this journey with me and best wishes to all of you on your future journeys as well! It’s been great reading this like a book, a few chapters each night. 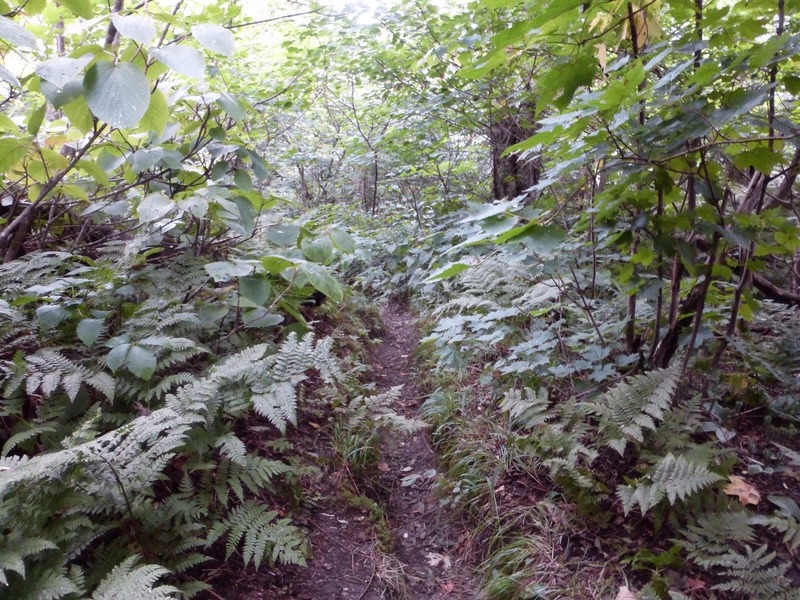 As always I enoyed your style of writing, photos, and general bits of info, but I must say this trail does not appeal to me in the slightest. 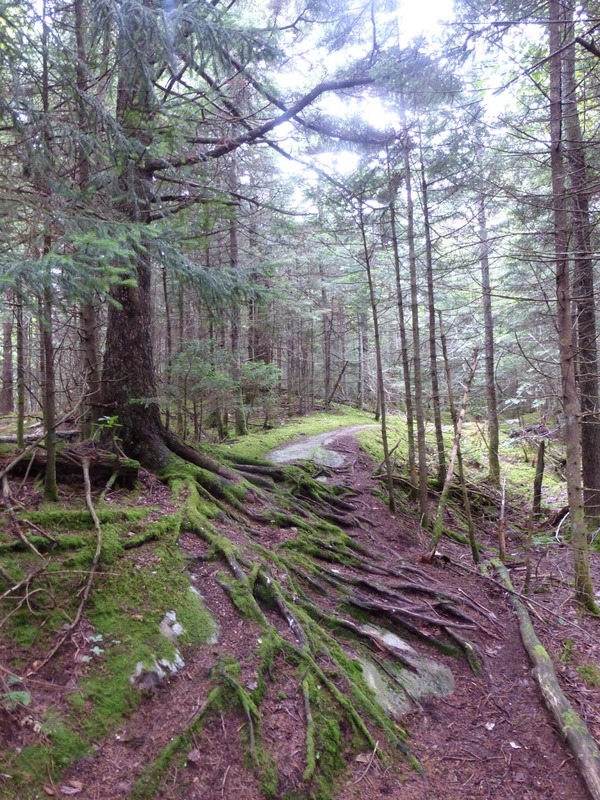 It just looked too rocky, and a lot of the same type of trail. With all the various blogs I’ve followed, and your own triple crown, I think the PCT would be my first choice If I ever get that chance. It just seems more varied, from desert to mountain etc. Coming from Perth, and with the BIB in my backyard, you know that I need something totally different to it. The AT seems a bit too BIB for me. I think the PCT I totally different to the BIB, aNd that’s what I’d want! Anyway I’ve waffled on enough. A delayed congrats on finishing your triple! And thanks as always for your blogging! So glad you got to read it all! 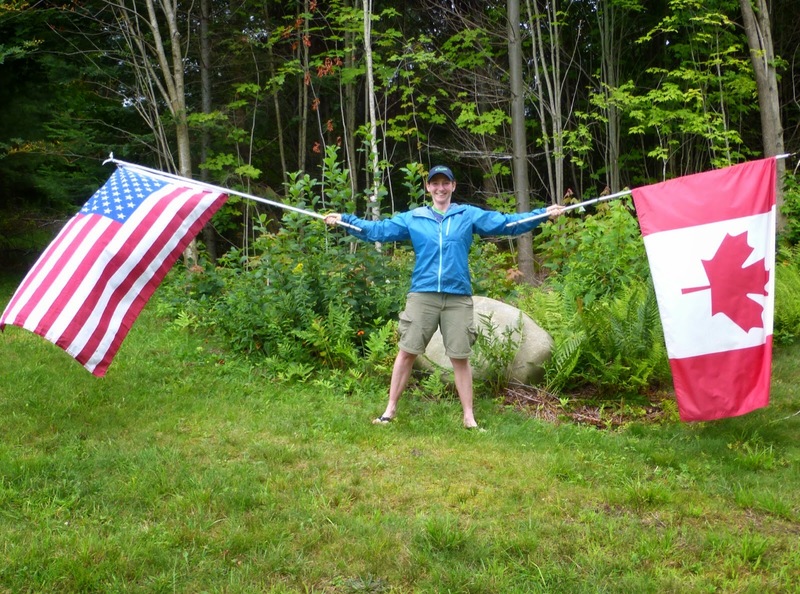 And yes, the PCT is the one to do!